A couple of days ago we wrote a post about how to jumpstart your spring cleaning. We made some recommendations of eco-friendly, effective, and most of all safe products for any and all of your home cleaning needs. Today we wanted to dive into another thing that can be cleaned up … your makeup bag! Many people do not realize just how toxic and unsafe many of the ingredients in the most popular makeup products are. Even high-end, expensive brands that you would expect to use high-quality ingredients oftentimes do not, and this can put your health at risk. This change does not have to be more expensive! Many clean brands offer prices similar to drugstore makeup prices. And if you’re looking for something more high-end for your inner diva, there are options for that as well! Like most people, you might apply foundation and other face products on a daily basis. The product and all the ingredients in it will stay on your face all day long. You want to make sure everything absorbed into your skin from these products is completely safe. Many of the most popular foundations on the market right now contain harmful ingredients like Talc and Octinoxate. Talc is known to cause respiratory issues and irritation when in powder form and has been linked to an increased risk of ovarian cancer. Octinoxate is a known endocrine disruptor that can disturb estrogen and thyroid activity. Many brands have options that you can feel safe applying every day. Rejuva Minerals carries alternatives to the common toxic powder foundations. Elate Clean Cosmetics has an amazing full-coverage foundation, a lighter-coverage version and a concealer too! If you’re looking for that extra punch try Fitglow Beauty’s vitamin-packed serum foundation. Lip products can be some of the most dangerous cosmetics due to the risk of accidental ingestion of toxic ingredients. When lipsticks and glosses sit on our lips for hours on end, it’s only natural that some of the product will get swallowed and wind up in our systems. Coal Tar Dyes and Synthetic Fragrances are just two examples of potential carcinogens and irritants in many popular lip products. Rejuva Minerals and Elate Cosmetics both carry clean lipsticks that could rival any of your favourite brands. Looking for a more luxurious lip? Try Fitglow Beauty’s Lip Colour Serum for the perfect combination of moisture and colour. You may think that organic, natural makeup brands would not have worthy, effective alternatives for your favourite eye products like mascaras and eyeshadows. The fact is, natural mascara can not only give you the same full lashes but all the nutrients can help your lashes grow! Zao Organic Makeup is known for their vegan, vitamin and antioxidant-packed formulas. They carry a wide variety of products for all your eye makeup needs like eyeshadows, eyeliners, and even eye primer. If you like to fill in your brows every day, try out Zao’s Organic Eyebrow Powder for a clean alternative to your favourite brow pencil or gel. Rejuva Minerals is another brand perfect for conscious beauty shoppers. If you’re looking for clean products at an inexpensive price and don’t want to skimp on quality Rejuva will become your new fave brand. The Mega Lash Mascara can help you achieve your favourite looks without compromising your health. Not only will these options help clean up the ingredients in your makeup routine, but they can also help make your entire routine more eco-friendly and waste-free. Elate Cosmetics and Zao use eco-friendly bamboo packaging for many of their products to cut plastic use and offer refills to reduce packaging waste. Switching to brands with more sustainable processes and beliefs can help reduce your ecological footprint, even if it may seem like a small change, every choice matters! Check out our makeup tutorial if you need any ideas for a fresh spring look! 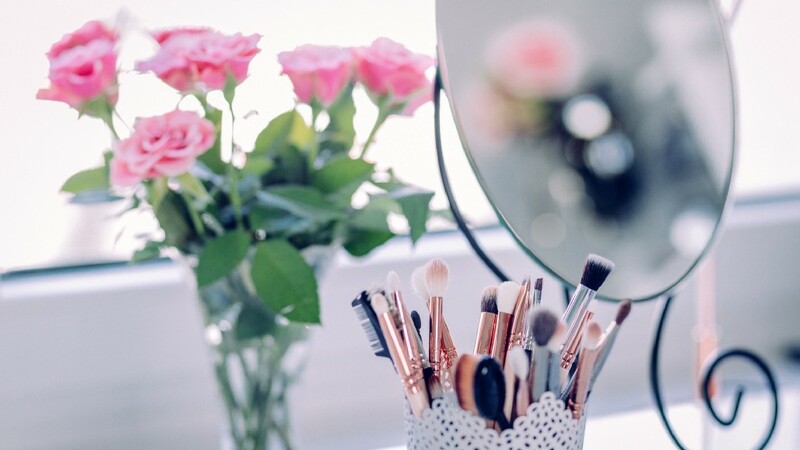 3 Ways to Spring Clean Your Makeup Bag was originally published in Think Dirty on Medium, where people are continuing the conversation by highlighting and responding to this story.